Bedbugs are a small bloodsucking insect that lives in bedding. That is how the Bedbug got its name. Bedbugs were eradicated in 1940 but recently have begun to return. There are reports of widespread Bedbug infestations all over the world. Bed bugs have been reported in hostels and hotels. Usually Bedbugs infest high traffic areas and are not detected until the Bedbug infestation is extremely wide spread. There are many different kinds of Bedbugs, but one Bedbug is common to all locations around the world. It is generally called the common bedbug and can usually be seen with the naked eye. Normally Bed bugs are not seen, because they feed only an hour before sunrise and even then only for about five minutes. 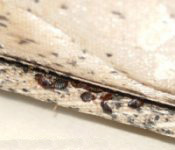 Bed bugs largely go unnoticed unless the infestation is very severe. The Bite of Bedbugs: Ouch! Bed bug bites are generally mistaken for flea bites or some other insect. The Bedbug bites are tiny oval-shaped insects and are not related to spiders and mites as some believe. Bedbugs come in several colors including white, black, brown, and tan. Bedbugs only eat blood and not skin as some people think. They mostly only feed for about an hour before sunrise. Bed bugs might be seen feeding at other times if the infestation is severe or they have not eaten in a while. The Bedbugs feeding time only takes about five minutes and their bite is normally not felt. A normal house generally is not infested unless someone has brought Bedbugs in. Bedbugs can come in through suitcases, clothing, new and used furniture or even carry on luggage. New furniture can pick up bedbugs in shipping and when it is stored. It is also possible for Bedbugs to find their way in from used furniture that has a previous infestation. Bedbugs like to make their nests in beds, bedding, mattresses, or anything else with stuffing. They are more likely to be found where they can nest but can be found in things like clothing. Washing clothing and bedding can help a Bedbugs infestation. Bedbugs are not just limited to areas with stuffing and can live in floors, walls, and bedposts if the infestation is bad enough. Knowing where Bedbugs are helps treat the infestation. If you are treating for a bedbug infestation, make sure that you have bed bugs first. Light infestations can be almost impossible to find and diagnose. The most obvious signs of Bedbugs are dirt or feces on the bedding. Sometimes you might be able to see the Bedbug hells from bed bugs who have shed. Getting rid of a Bedbug infestation of Bedbugs can take a very long time. There are a lot of popular do it yourself methods but you have to make sure you know where they are first. There are mattress covers that can starve them, there are pesticides and powders that poison them, and there are sprays to kill them dead. Most people who have success, use a combination of methods and always use the non toxic bedbug sprays because they have been know to work better. Dead Bed Bugs recommends using the EPA’s Integrated Pest Management system approach when killing bed bugs. All products and regimens on our website are in accordance to the EPA’s recommendations and under their strict guidelines. Bed bugs are wingless, approximately 1/4-inch in length with a flattened oval shape and rusty brown in color. Bed bugs can seem to come from nowhere, but are being seen more and more in apartments, hotels, homes, shelters, dormitories and nursing homes. Bed bugs may also be behind baseboards, pictures, frames, windows, door casings, loosened wall paper, curtains, cracks in plaster and behind electrical wall plates. Bed bugs are not picky eaters when it comes to location — any exposed skin will do — but they won’t necessarily go farther than they have to. Bed bugs can be found in luxury hotels and by-the-hour joints alike. Bed Bug 911 has the products and techniques you need to take to prevent bed bugs from hitching a ride home with you from your summer vacation. Bed bugs are tiny little critters, but they can really pack a punch, not to mention a serious measure of fear. Just the sound of the term “bed bug” is enough to leave people itching for days and checking under. If you’re considering buying or renting a house that’s had previous occupants, read this article about how to detect bed bugs before signing! Lawrenceville, N.J.—Bedbug season is here and despite public awareness campaigns, a national survey shows that large swaths of the public are unable to answer the most basic questions about bedbugs correctly. Bedbugs, which are about the size of a grain of rice, nestle in furniture and bedding upholstery and are notoriously difficult to get rid of. Copyright © 2015 DeadBedbugs, all rights reserved. Visit Our Shopping Cart for a full list of products. All Dead Bed Bugs Products and the products of its divisions are safe and non-toxic when used as directed. Dead Bed Bugs is not a substitute for medical advice. The operators of this website and those who provide information for this site do not directly or indirectly practice medicine or dispense medical advice or services through this website. You should not rely on this information to determine a diagnosis or course of treatment, nor should it be considered a replacement for consultation with a physician or other certified healthcare provider. Dead Bed Bugs does not make representations or warranties with respect to any information offered or provided on or through any company websites regarding treatment, action or application of product. Neither Dead Bed Bugs nor any of its divisions or contributors shall have any liability for the content, errors or omissions in the information provided by this website. Neither Dead Bed Bugs nor its divisions are responsible or liable for any advice, course of treatment, diagnosis, or any other information, services or products that you obtain through this site.